Manx gymnast Grace Harrison has been awarded the President's Award for her outstanding contribution to the Manx Commonwealth Games team in Glasgow. 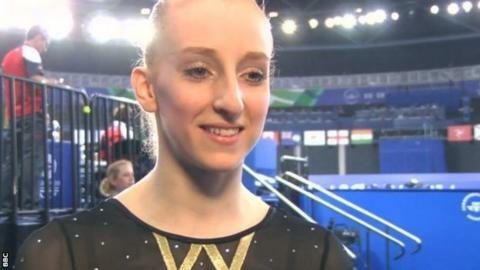 During the Games the 19-year-old became the first female Manx gymnast to reach an individual Commonwealths final. Harrison, who deferred university to train full-time for the Games, said she was "incredibly proud". The award is given to an individual who made an outstanding contribution to the team. The young gymnast who has now started university said she is determined to represent the island at the next Commonwealth Games in 2018. Juliet Holt, president of the Isle of Man Commonwealth Games Association, said: "Grace has put in a tremendous amount of hard work since she began competing at six years old and has made many sacrifices in order to achieve her sporting ambitions." Peter Kennaugh won silver in the men's 40km points race to earn the Isle of Man's only medal in Glasgow.